We are very excited to introduce our latest addition to Hop Pickers Rural Retreats, which will open for bookings from Friday 23 October 2015. Tucked away in the trees overlooking the fields towards the magnificent Malvern Hills, a romantic hand crafted Shepherds Hut will offer luxury accommodation for 2. King sized bed with goose down duvet and fine linen, hand crafted oak fully fitted kitchen, shower room and WC, fluffy towels and bathrobes are all inside the cosy bespoke hand crafted hut. Under floor heating and an Aga ‘Little wenlock’ wood burner will make it a special retreat to snuggle up and read a book, watch TV, listen to the Roberts radio or surf the internet. Venture outside for star gazing and toasting marshmallows on the fire pit or relax and de-stress in the bubbling hot tub in this secluded tranquil spot set within the woodland. There is a 2 night minimum stay and prices will be from £90 midweek and £110 at weekends. 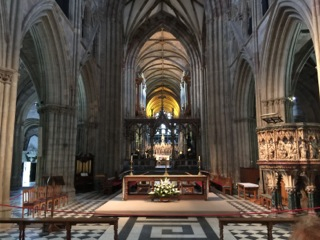 Visit this magnificent Cathedral ♯1 Trip Advisor of 80 things to do in Worcester . Visit the tomb of King John and the Magna Carta Exhibition, take an historical tour or climb the tower for stunning views across Worcester. The Cathedral has a Programme of events for 2015-2016 celebrating the 800th Anniversary of King John sealing Magna Carta in June 1215 and commemorating the 800th anniversary of his death and burial in 1216. 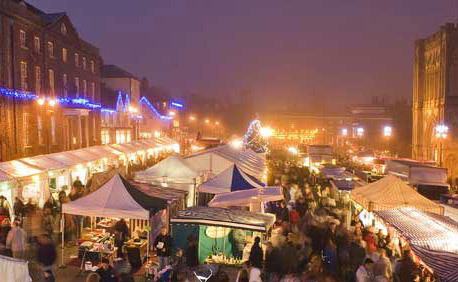 With over 300 stalls from all over the world, two stages of entertainment, traditional funfair and lots of free activities Bury St Edmunds' 12th Annual Christmas Fayre should not be missed. There's something for everyone! The Games room is now going back to it’s original name of The Old Cow Shed and we are updating the room having added a large wood burning stove to make it cosy for fun evenings or dreary damp Autumn/Winter days. We have added a very comfy leather sofa, some pine captains’ chairs and a TV with a selection of children’s videos and the Wii. Now we have accommodation for 11 people you can all get together in ‘The Old Cow shed’ and hold a table tennis tournament, game of darts or have fun racing the scalextric cars.